Malta in autumn means that you can wake up to a sparkling blue Saturday. This morning, the Malta Book Fair was the trigger for a walk with my seven year old along Grand Harbour. I wanted to make the most of the sun, and the water. We often go to Valletta on Saturdays, sticking to the shops and cafes. But today warranted a deviation from the norm, and our usual parking spot along Marsamxett Harbour, the other side of the peninsula. I park on Crucifix Street. A cruise liner was doing a 180 degree turn in the harbour, so to get a closer look we walked into Pinto Wharf below. It’s a real grandstand view of the fortifications of the Three Cities across the water: St Michael at the tip of Senglea, St Angelo dominating Birgu, and a very 21st century cruise liner almost as high as the bastions. You feel like you’re on a film set. And yet, it’s intimate. Then we walk on towards the elegant Customs House, built in 1774. On a Saturday it’s closed but on weekdays it’s teeming with people queuing at the Department of Customs. We walk past a row of men and their children with fishing rods. The smell of fish lingers in the air; not from their catch but from the fish market next to them. On weekdays, it’s Malta’s version of London’s Billingsgate. Here, the area is known as Ta’ Liesse. While just an oil-smeared wide patch of tarmac today, for three nights in July it becomes the magical setting for the harbour-side Malta Jazz Festival. My son wants to go to the Great Siege Bell, the memorial to the fallen of World War II. So we climb up the steps to the ten tonne bronze bell. The sea below us twinkles, the Lower Barrakka Gardens and its arches behind us. Sometimes it feels like there are more cameras than people. We walk up Triq il-Mediterran to the old “Sacra Infermeria” of the Order of St John of Jerusalem, now just known as MCC or Mediterranean Conference Centre. It doesn’t quite have the same ring to it. The place is teeming with stalls, bookworms, their parents and their children. We buy the token book, but we’re both itching to go back to the sun and the blue. We take the higher road so we can get to Lower Barrakka Gardens. But kids love pit stops, so we decide to get a snack at the QE2 kiosk, one of those hole in the wall bars with chairs and umbrellas outside, cheek by jowl with the gardens. They make wonderful ftiras with tuna, capers, olives and tomato paste at QE2. We wash it down with Kinnie, another perennial favourite. 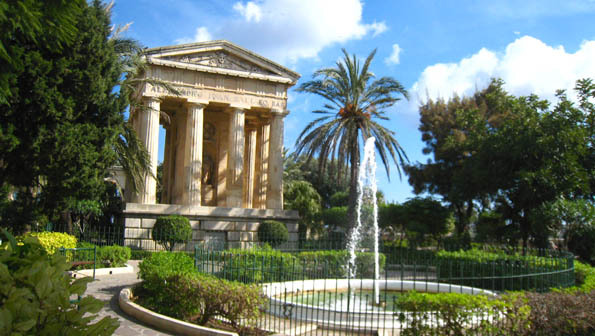 The Lower Barrakka Gardens are dominated by the monument in honour of the first British governor of Malta, Sir Alexander Ball. It’s a very peaceful place, less busy than its counterpart at Upper Barrakka, but equally impressive for views of the memorial bell and the harbour. Definitely not one for people who have fear of heights. We walk down Triq Lvant. A great selection of balconies with washing lines, old ladies, sculptures and statues to our right, the Bridge Bar above us. Then down through the Victoria Gate, Ta’ Liesse. It was opened to the public in 1885 during the Governorship of Sir Arthur Borton (1884-1888) and is now gettting a much-needed facelift. As we double back, walking up Xatt il-Barriera, the sun has climbed higher and it feels like a spring day. My son’s had a good dose of history, pleasantly encountered and related as we walked. I think we chatted through some 500 years in the life of Grand Harbour – perhaps even of Europe.